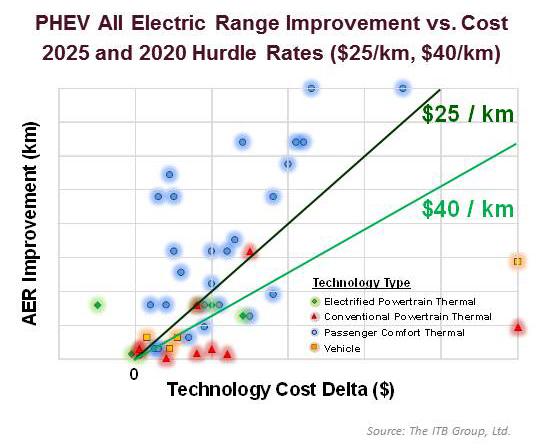 The ITB Group released its latest thermal management report focusing on the advancements for electrified vehicles. The ITB Group released its latest report, “Thermal Management Advancements for Electrified Vehicles” in August 2017. Tremendous investments are being made in electrified vehicle technologies to meet government targets in an economical way. This extensive report includes an in-depth evaluation of market and technical developments of thermal management technologies for electrified vehicles and sub-systems. A value assessment is made for over 40 thermal technologies being developed and commercialized. A core to ITB’s work is evaluating commercial and organizational barriers to successful technology commercialization. The report covers advanced powertrains including 48V mild hybrid, strong hybrid, plug-in hybrid, battery electric and fuel cell light-duty vehicle configurations. Market coverage includes China, Europe, Japan Korea and North America. The time horizon for the report research is 2017 – 2025. An ITB Director can provide additional details and an on-site executive summary presentation. If interested, please contact The ITB Group directly. Below is a partial listing of upcoming events, where attendees will be able to see presentations related to their field of study, and will also be able to talk directly with The ITB Group regarding this and other reports. A full listing of current and upcoming conferences can be viewed online at: http://www.itbgroup.com/conference-schedule/. The ITB Group, Ltd. is an international automotive technical/business consulting firm headquartered in Novi, Michigan, USA. The company provides technical and business advice to OEMs, component and material suppliers in North America, Europe, and Asia. The ITB Group is a leading expert in technology economics for automotive applications. Furthermore, the firm provides guidance for various forms of supplier transactions including technology licensing, mergers, and acquisitions. Additional background can be found at http://www.itbgroup.com.